Phyllo dough has always been something fun for me to cook with. The paper thin (sometimes almost thinner than paper) dough when stacked between layers of ground nuts and cinnamon, then soaked in flavorful syrup to make Baklava is one of my favorite desserts. Phyllo can also be wrapped and baked around large prawns for easy appetizers or folded and filled with savory fillings. Today I wanted to play around with the standard thin sheets of phyllo, and another style that is shredded phyllo called Kataifi. Kataifi may also be used in creating wonderful savory appetizers, but for a lot of “Mediterranean” and middle eastern countries, it is part of a traditional dessert called Kanafeh. Just to make it easy, traditional kanafeh is formed by sandwiching two layers of buttery fried kataifi (the shredded phyllo) between an inside layer of chewy or a creamy cheese. The kanafeh is then soaked in a simple syrup of lemon and rosewater or orange blossom water. It can be garnished with crushed pistachio or almonds and sometimes has a bright orange-reddish color (from artificial coloring) used to give it decorative appeal. So what did I go and do? Well, I did it my way… both of these recipes and I think they turned out fantastic! So what I am calling this is actually a version of “Ruffled Milk Pie,” but “Milk Pie” just doesn’t seem to fit, so Ruffled Apple Tart it is. I ran across this idea reading a Greek dessert cookbooks and throwing a couple of ideas together. It turns out a lot of =different cultures who use phyllo dough have the same ideas… but I like mine so am going for it. So whatever this dessert really is I can tell you it was perfect. Custardy on the bottom, buttery, flaky phyllo on top with hints of cinnamon and spice (thanks to my More Than Pumpkin Pie Spice) and lots of citrus from the lemon. Give my Ruffled Apple Tart a shot the next time you have company over, or at a brunch. It’s perfect and visually…Ruffly! ready for the first bake! Preheat the oven to 400 degrees. Using a deep pie dish or round cake pan, butter the inside all over with melted butter. Set aside until ready to use. 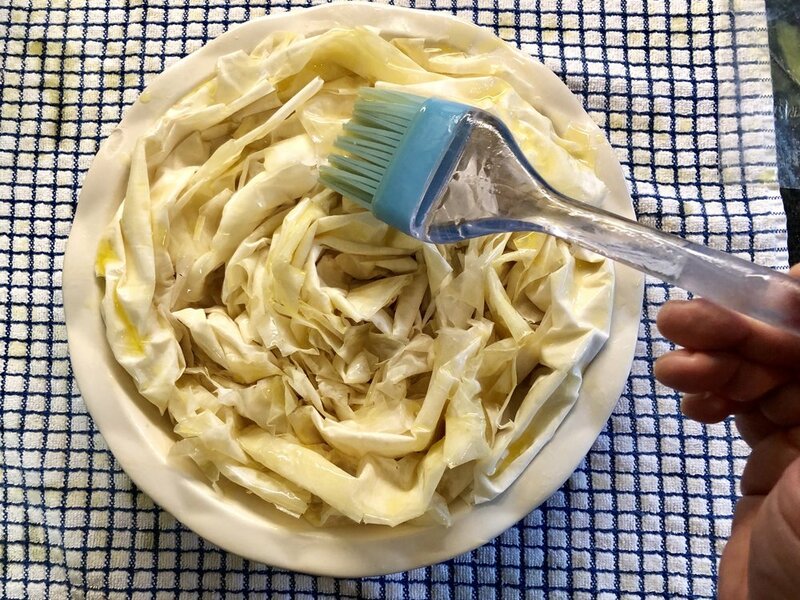 Lay out a stack of thawed phyllo dough sheets and over with a light kitchen towel to prevent the dough sheets from drying out. Have your melted butter and a pastry brush at the ready. Lay out one sheet of the phyllo dough and gently brush the entire top if it with the melted butter. 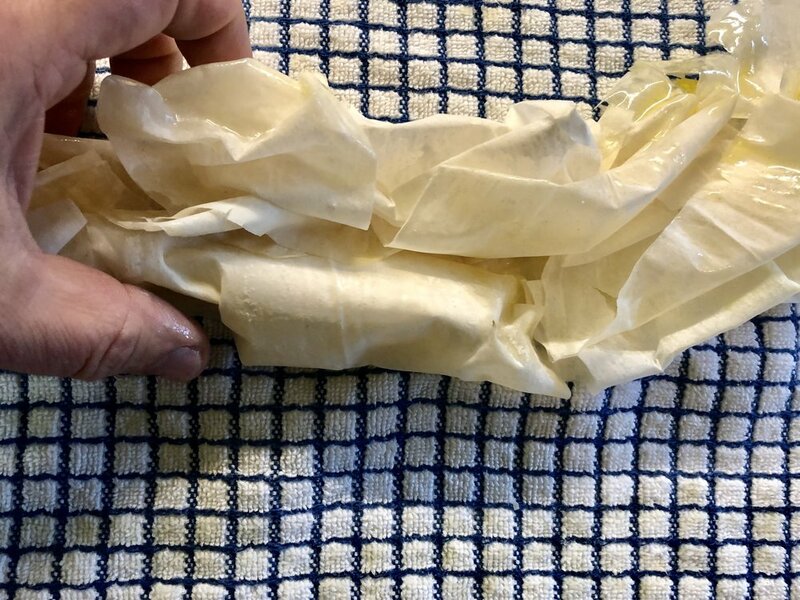 Gather the dough up “roman blind” style and gently roll and coil the dough into a relatively tight rosette. This will be the center on the tart. Continue the same process only spiraling the gathered up phyllo around the rosette and subsequent wrapping of the dough. Pretend you’re making a large rose or flower with the dough. Place your ruffles into the oven and bake for 15-20 minutes or until golden and crisp. While baking go-ahead and make the custard. Add the four eggs, sugar, 1/2 teaspoon of More Than Pumpkin Pie spice, and the lemon zest. Mix until smooth. Add the heavy cream and mix thoroughly. One the first bake is over, and the phyllo is golden and crisp, remove from the oven. Add the thinly sliced apples around the circumference of the tart and in between the ruffles. Reduce the oven temperature to 375 degrees. Pour the custard over the top and around the sides of the tarts. Pour evenly and tilt the pan if necessary to make sure your custard is disbursed throughout the bottom. Place the tart back in the oven and bake an additional 20-25 minutes until the custard is firm. Remove from the oven and cool completely before slicing. Dust the top with powdered sugar and serve. In a medium saucepan make your syrup. Add the sugar, water, orange peel, salt, and star anise. Bring to a boil then down to simmer. Simmer for 15 minutes on low. Remove from the heat and cool. This could be made a day ahead of time for optimal flavor. In a large ( I mean really large) start pulling apart the kataifi and shredding it. Pull, stretch, break up the shredded dough. Make sure there are no clumps! Drizzle in the melted butter and toss to coat the shredded dough thoroughly. Separate the kataifi into two equal parts. In a large nonstick skillet, brush the entire inside with melted butter. Heat the pan on a medium flame and add one half of the shredded kataifi. Pat the dough down into one even layer on the bottom the pan making sure it encompasses the entire inner diameter. Slowly fry/toast the kataifi until golden brown (yes you can lift up and edge and check). The layer should slide easily in one large piece. While the first layer is cooking mix together the filling. Combine the ricotta, sugar, orange zest, and vanilla. Mix until smooth. Spoon the filling on top of the first layer and smooth out evenly to about 1/2” from the edge. Place the second layer on top and equally smooth and pat down as you did the first layer. Using a large round plate or platter the same size of your pan, place it face down on the top of your pan. Gripping both sides of the pan while holding down the plate, flip the kanafeh out onto the platter. The golden brown bottom is now your golden brown top! Wipe out your pan, re-butter it, and carefully slide the kanafeh back into the pan so your last layer can fry and toast to a golden brown. Once the bottom is nice and golden pour on the syrup… all of it! Let the syrup bubble and boil, while sweetening the kanafeh and reducing. Again slide the kanafeh out onto a platter (you do not have to flip… just slide). Garnish the top with ground pistachio, and “candied” orange peel from your syrup! Let the kanafeh cool, then slice. Enjoy! Crips, sweet, creamy, and packed with flavor! Kanafeh !